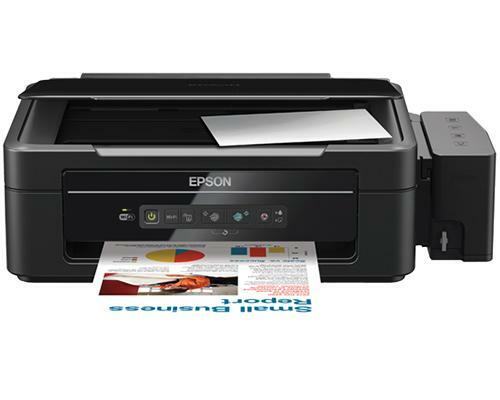 Wi-Fi connectivity enables the Epson L355 to be shared among multiple users at home or within the office. An array of functions, including scanning, copying and printing can be used on a wireless network. Wi-Fi connectivity eliminates the need for expensive and messy wiring, enabling versatility and mobility. Epson iPrint offers the convenience of wireless printing direct from your iOS™ or Android™ devices. With iPrint, you can easily print web pages, Microsoft® Office™ documents, photos and PDFs over your home or office network. You can also scan and save onto your mobile devices, send as an email or upload to a cloud service such as Box.net, Dropbox, Evernote® or Google® Docs™. Epson iPrint is free to download from Apple App Store and Google Play Store. The L355 All-in-One (AiO) printer is compactly designed to take up lesser space than its predecessor, so that you won't have to worry about finding space for it. Each purchased bottle of Epson black ink yields up to 4,000 pages. The L355 is bundled with four bottles of ink (Cyan, Magenta, Yellow and Black), plus two additional bottles of black ink to deliver up to 12,000 pages (black). Busy offices will appreciate the improved printing speeds of up to 33ppm for draft black & white, and up to 9ipm for default black and white printouts. High volume printing has never been this quick and efficient. The L355 gives you the added convenience of scan and copy functions. With its precision 1200 dpi x 2400 dpi sensor, the scans are sharp and clear while draft mode copies are completed in just 5 seconds for black and 10 seconds for colour documents. The L355 is equipped with Epson's proprietary Micro Piezo™ print head technology driving a high resolution of 5760 dpi x 1440 dpi that delivers exceptional prints for both text and images. Epson specialty media is developed to complement Epson genuine inks to produce exceptionally high quality prints. Epson genuine inks are designed specifically to work with your Epson printer to deliver long lasting prints.